VIENNA, Aug 8 2014 (IPS) - Austrians call it “UNO-City”. The United Nations calls it the Vienna International Centre (VIC). Both names give a hint of the scale and scope of the U.N’s headquarters in the Austrian capital, but not the full story. As the VIC marks its 35th anniversary, it is worth reflecting on the U.N. family’s work here and its crucial role as one of the U.N.’s four global headquarters. Increasingly, sustainable development is a thread running through the work of all U.N. bodies, including those in Vienna. The VIC’s three Y-shaped, interlinked buildings are certainly a product of their time. There is a retro 1970s feel to the orange-coloured lifts and to some of the corridors. Yet the VIC has of course been modernised over the years to host a broad range of major events and more than 4,000 staff working at 14 bodies on topics ranging from nuclear safety to outer space affairs and from combatting drugs and crime to promoting sustainable industrial development and energy. Six years ago Secretary-General Ban Ki-moon, a former South Korean ambassador to Vienna, opened an additional state-of-the-art conference building that he said further underscored Austria’s commitment to multilateralism, a commitment that highlights the country’s neutrality and geopolitical location. When it comes to news, many people link Vienna with the International Atomic Energy Agency. Yet while it has often made headlines because of Iran, the Democratic People’s Republic of Korea (DPRK) or Fukushima, the Agency’s work covers much more – including supporting the peaceful uses of nuclear technology in health and agriculture. Other parts of the U.N. family in Vienna make headlines in their own way. The Preparatory Commission for the Comprehensive Nuclear-Test-Ban Treaty Organisation promotes the treaty that bans all nuclear explosions and is establishing global verification to ensure no such blast goes undetected. Indeed, its monitoring picks up not just nuclear explosions such as those most recently conducted by the DPRK but also earthquakes like the one that caused a tsunami to hit Japan in 2011. 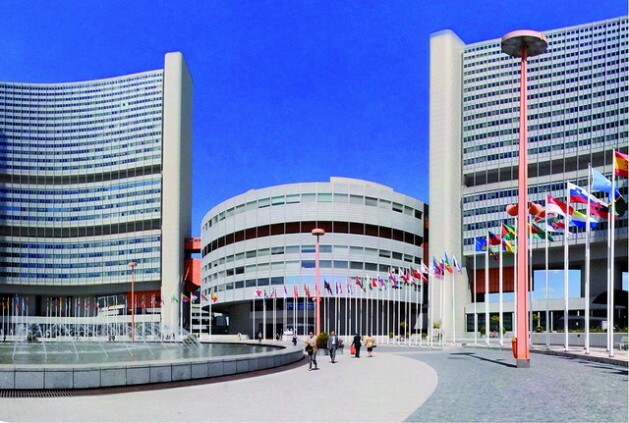 Atoms apart, the United Nations in Vienna is well known for its work tackling drugs and crime, including through a network of field offices and through its flagship World Drug Report. The U.N. Office on Drugs and Crime (UNODC) also plays a vital role in promoting security and justice for all. Increasingly, sustainable development – a top priority for the Secretary-General and Member States – is a thread running through the work of all U.N. bodies, including those in Vienna. The United Nations Industrial Development Organisation, whose presence in Austria predates the VIC by more than a decade, is a good example, along with UNODC. Far newer but weaving that same vital thread is the Sustainable Energy for All initiative. Its headquarters are just outside the VIC in an adjacent emerging office and residential district but it is a dynamically growing organisation that is very much a part of the U.N. constellation. The U.N. Office for Outer Space Affairs is also heavily geared to playing its part in sustainable development as it promotes international cooperation in the exploration and peaceful uses of outer space. Smaller offices include the U.N. Postal Administration, the Interim Secretariat of the Carpathian Convention (United Nations Environment Programme), the International Commission for the Protection of the Danube River, the Office for Disarmament Affairs Vienna Office, the U.N. Register of Damage Caused by the Construction of the Wall in the Occupied Palestinian Territory, the U.N. Commission on International Trade Law, the U.N. Scientific Committee on the Effects of Atomic Radiation and the International Narcotics Control Board. They may not always grab media attention but their targeted technical work has a concrete impact in their respective fields. The United Nations Information Service Vienna helps to coordinate public information work by those U.N. bodies based in Austria, and is a good starting point for those wanting to know more. It also serves as an information centre for the public, media, civil society and academia in Austria, Hungary, Slovakia and Slovenia, and provides guided tours at the VIC. In case anyone wonders, the international bodies based at the VIC split the running costs and pay Austria an annual rent of seven euro cents – it used to be one Austrian Schilling. Needless to say, Vienna is enriched by hosting the United Nations – and other international bodies such as the Organisation of Petroleum-Exporting Countries, the Organisation for Security and Cooperation in Europe and the European Union’s Fundamental Rights Agency. Certainly for the United Nations family, Vienna offers a tremendous venue for technical work, mediation and decision-making that contribute to the global goals of peace and security, sustainable development and human rights. And it is all done in what the Director-General for the U.N. Office at Vienna, Yury Fedotov, likes to call the Vienna Spirit – a spirit of pulling together to decide and then take action. Next Friday, Aug. 15, a joint-U.N.-Austrian celebration will take place to commemorate the 35th anniversary, which falls on Aug. 23. Martin Nesirky is Acting Director, United Nations Information Service Vienna.